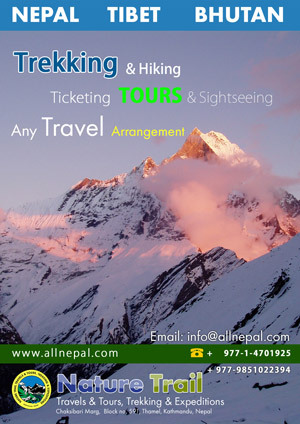 Special offers, discounts to mark World Tourism Day | Provides complete information about Nepal‘s local product, business, news, events, coupons, local hero, local model, local culture, travel, trekking, biking or anything that related to Nepal. KATHMANDU, Sept 19: Hoteliers on Wednesday announced a discount of up to 50 percent on accommodation and food for foreign tourists for a week from September 23 to mark the 33rd World Tourism Day. Tourism entrepreneurs also announced free dinner and free entrance along with discounts on various services such as air tickets, rafting and others on September 27 — the World Tourism Day (WTD). Briefing the press on Wednesday, spokesperson of Nepal Tourism Board (NTB) Aditya Baral said different tourism related organizations were also organizing various festivals to mark the day. According to Hotel Association Nepal (HAN), all its member hotels will provide 25 percent discount on food for all. “Five tourists will be offered free accommodation for four nights on the basis of lucky draw on the WTD,” said Madhab Om Shrestha, executive director of HAN. Likewise, hotels under Tara Gaon Development Board (TGDB) are offering 20 percent discount on food and 50 percent discount on accommodation for the tourists arriving between September 23 to 27. Restaurant and Bar Assocation of Nepal (REBAN) is giving away complimentary voucher for lunch or dinner for eighty couple. REBAN, Pokahra is organaizing Mini Stree Festival to mark the occasion. Nepal Association of Rafting Agents (NARA) is also offering 20 percent discount to all rafter on September 27. The association has also announced it will provide free rafting voucher to first two arriving tourists. Nepal Tourist Vehcile Associaiton is providing free transportation to first group of tourist of first flight into Tribhuvan International Airport on that day. On Tourism day, tourists will also get free entrance and free tour guide in Hanumandhoka Durbar Square. Baral of NTB said that other activities that will last till September 30 includes workshop, interaction programs, felicitation to tourism contributors, clean-up campaign, launching of community homestay in Humla and others. Hiya, I’m really glad I’ve found this info. Nowadays bloggers publish just about gossips and internet and this is really annoying. A good blog with interesting content, this is what I need. Thanks for keeping this web site, I’ll be visiting it. Do you do newsletters? Can not find it. Thanks for posting this thought-provoking blog. As we all know, many people have determined opinions, however, I have always had an open mind. Events each week require that we remain open to the “new.” When I have the time, I hope to return to read more of your writing. How often do you upload your posts so I can return to your website? I do believe that we could share many similar ideas.